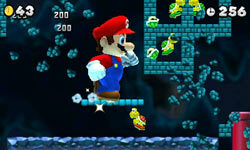 New and returning power-ups that dramatically affect Mario’s platforming abilities. Bowser has once again kidnapped Princess Peach, but besides rescuing his lady love, this time Mario has another objective. 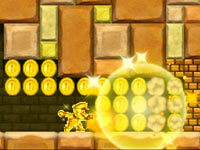 The Mushroom Kingdom is bursting with more gold coins than ever before. Each level is littered with gold as coins rain down from overhead pipes, trails of coins are left behind special gold enemies and gold pipes transport Mario into coin-filled caverns. It’s up to players to collect as many coins as possible throughout their adventure. 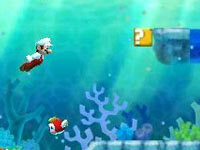 New Super Mario Bros. 2 allows players to share the fast-paced fun with a friend over a local wireless network. The game’s 2-player co-op mode requires both players to have a Nintendo 3DS system and a copy of the game. Together players can play through the entire game, collect double the coins, team up to unleash devastating double Ground Pound attacks on enemies, and more. An extra player can even help when continuing from your solo play save file. Coin collection is important in every adventure in the Mushroom Kingdom, but New Super Mario Bros. 2 takes this to new heights. 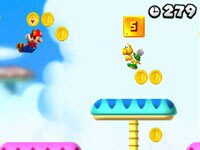 The game is filled with more coins and gold-related features than any Mario game before, and includes the frenzied Coin Rush mode in which you play three levels back to back trying to earn as many coins as possible. In fact, the game literally holds more than a million possible coins, and keeps track of each for you as you proceed from beginning to end. SpotPass functionality built into the 3DS allows you to share your running total with friends. If you reach a million coins, you’ll get something special. 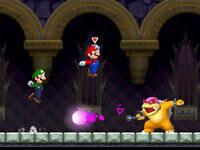 Utilize a wide range of new and returning power-ups and items spread throughout the game world.